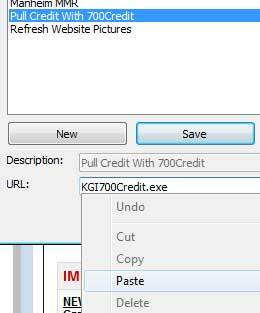 When you install the KGI 700Credit portal you may have a case where clicking the link from within the Web button does nothing. This can happen on certain machines if the location of the program is not the same as what we have defaulted. The fix is a one time change and it is quick. Just follow these steps! When that window opens the top address bar in Windows Explorer will give you your current folder path. Click that address bar as seen in this image below and copy that folder path. NOTE: If you need a different way to learn the folder path follow these steps. Then in the URL section below PASTE the folder path you copied. C:\users\public\Dealer Solutions\KGI700Credit.exe but it may vary depending on the location of your Dealer Solutions Software.